Cook’s Country is a constant supply of new recipes for me every time the newest issue of the magazine comes up. They usually have lots of great recipes, some that take more time than others, but many that are perfect for quick weeknight meals. Such is the case with this super easy recipe for sweet and spicy pork tacos. I had just happened to pick up some boneless country-style pork ribs that were on sale recently and was looking for something easy to do with them and this recipe fit the bill perfectly. We all love tacos in our house so this was a great variation for us. Season the pork with salt and pepper. Heat 1 tablespoon of the vegetable oil in a nonstick skillet over medium-high heat until it is just smoking. Add the pork and cook until the pork is no longer pink, about 5 minutes. Remove the pork to a plate and set it aside. Heat the remaining 1 tablespoon of vegetable oil in the now-empty skillet over medium heat until the oil is shimmering. Add the onion and cook until the onion is softened and beginning to brown, about 4 minutes. Add the garlic and the cumin and cook until both are fragrant, about 30 seconds. 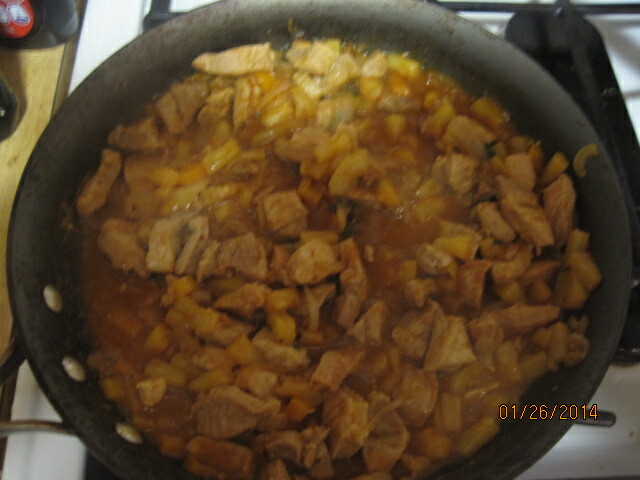 Add the pork and any accumulated juices back to the skillet along with the pineapple and the reserved pineapple juice and the chipotle. Bring the mixture to a simmer, cover the skillet and cook, stirring occasionally, until the pork is cooked through and the sauce has thickened, about 10 to 12 minutes. Stir in the cilantro, season with salt and pepper to taste, and serve the pork with the warm tortillas and any other accompaniments. I served this just with some guacamole, sour cream and some lime wedges along with a side of Dominican-style rice, which I plan to post the recipe for tomorrow. 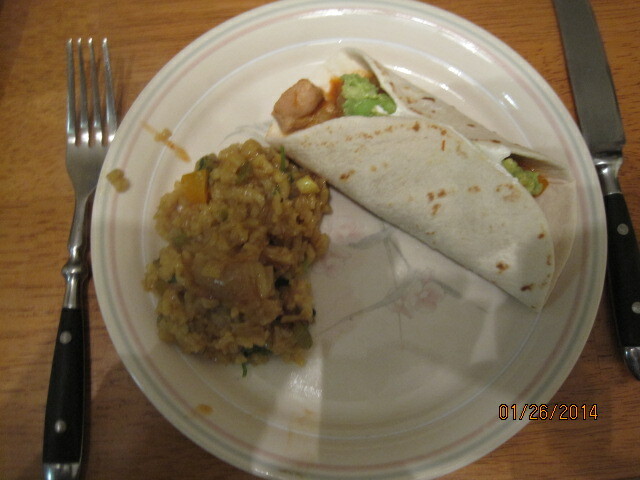 The sauce was wonderful with a little beat of hear from the chipotle and the sweetness of the pineapple. I loved the mix of the pork and pineapple in these tacos. The taste was incredible and I could easily eat this outside of a taco as well. We didn’t have too much leftover, but was left was eaten for lunch the next day and tasted even better thanks to the sauce thickening even more in the refrigerator. I will definitely be making this one again. That’s all for today. Check back next time for another recipe. I plan to give the recipe for the Dominican rice along with a quick cole slaw I had made with our fried chicken biscuits last week. Both were great side dishes that you can make with a bunch of different meals. I also still have lots of other recipes that I have tried recently to share, so keep checking back. Thanks to everyone who keeps following along with the blog. The response has been great and I had more visits in the month of January this year than I did in all of 2012, so I am glad people are enjoying what they are finding and thanks for coming along. Until next time, enjoy the rest of your day and enjoy your meal!